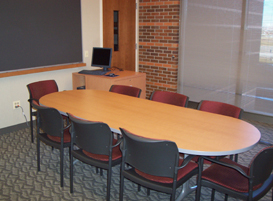 Smaller conference rooms (breakout spaces) measuring about 250 square feet feature a conference table with six to eight chairs. 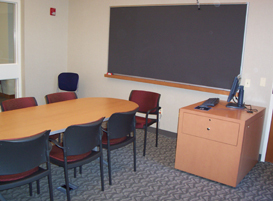 The smaller conference rooms contain all of the technology found in the larger spaces - LCD projector and screen, cabling to connect a laptop, computer, DVD and VHS players and a document camera. This venue is ideal for smaller groups or when your large group needs to divide to work on assignments. All rooms provide natural light. Video conferencing is available in the smaller conference rooms through a portable Tandberg cart. Please ask your Conference Planner for details or a tour today.